→Google Adsense Pin not received-What to do next? Adsense is undoutdely a life line for every blogger.So many bloggers are there who depends upon it for earning.However before paying,Google verifies your address by sending a verification Pin which contains 4 digit Pin. 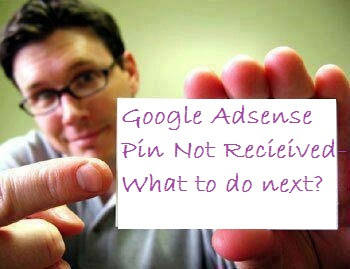 What is Adsense Pin and Why does they send it? As written earlier,Adsense PIN is highly confidential secured number sent by Google Adsense to its publisher.They send it either through Bluedart courier service or through Postal service.They does so to confirm your identity.They don’t want to send payment to anybody so as i guess,it is necessary as well. How much Time does an Adsense Pin take to reach? Normally,Adsense doesn’t take much time but in asian and other small country,it takes more than 50% time as specified.It is quite logical as well so if you are an asian Publisher then it will definitely take more than even a month.Most of the people says that they got it after 41 days or so. Normally Adsense sends Pin after 5 days when it appears on your dashboard.If you live in USA,UK or any western countries then it will take approx 21 days.However for asian publisher,it will take more than 40 days. Google Adsense Allows you to apply three times for PIN.It means if it failed to reach you in firts attempt,you can request them two times more. Sometimes,it happens.Users doesn’t get their verfication PIN even after requesting thrice.If you are also among them then don’t worry at all because Google will send you a Mail with two methods to remove the PIN number restriction. Method 2 -Recheck yoyur Mailing Address again.If it is wrong then correct it and inform Google about it so that they can send it again via standard air mail. Recommended Article–Is It really tough to get an Approved Adsense Account in India? Why are you Tensed Now? Don’t get Tensed.If you have already completed three requests for verification PIN but haven’t received it yet then wait for the EMail from Google Adsense.Once it appears in your inbox,send Digital Image of your ID Card,Bank statement or any other document which contains your Address.Make sure that the address in sent document and your adsense account is same.If your document contains language other than English then translate it via Public Service Notary. Through my Post “Google Adsense Pin not received-What to do next?”, I tried my level best to clarify the confusion of Gautam Mandal and many other new adsense publishers who are waiting to receive their Google Adsense verification Pin. If you still have any query in your mind then feel free to ask me through comments.It would be a pleasure for me to answer your questions.